That’s an estimate of how many hours a week I’m physically stationary. It equates to over half my waking hours: commuting to work, sitting in front of a computer for much of my day at the office, eating a meal, watching television, checking email, or a variety of other low-motion activities . After nearly 20 years, it caught up with me. I found myself overweight and increasingly unhealthy. So around Valentine’s Day of 2013, I decided to do something about it. For the first time in my life, I stuck to healthy habits for a year, and it worked. The result is that I’ve lost between 35 and 40 pounds, dropped 5” inches around my waist, invested in a new wardrobe, and found a new outlook on life. 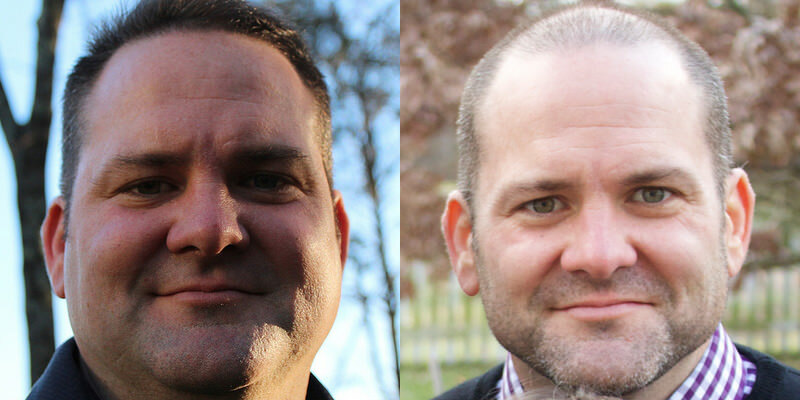 Before and after: the difference a year can make. Now, it wasn’t easy—I didn’t discover some weight loss secret or magical fat-burning Tahitian melon. It took time, effort, dedication, and focus. One discovery was that diet and nutrition weren’t something I only needed to think about at home. When I looked at the times of day I eat, I realized I consumed about two-thirds of my meals at the office. I soon saw that this was as much of a work problem as it was something to master at home. So, I started by rethinking my office eating habits. Working in my favor was a growing availability of activity and nutrition trackers, and that some of my colleagues at Viget were making their own changes. In the end, my success came down to a conscious diet, consistent exercise, and involvement in a community with similar goals. 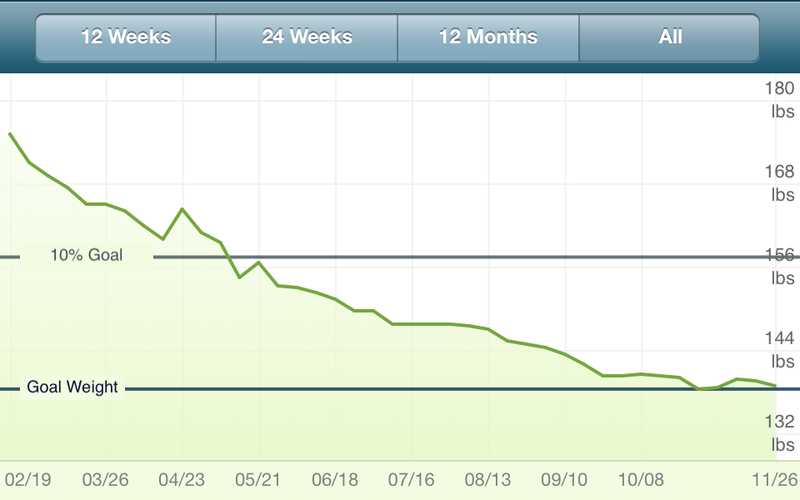 My weight loss graph from February to November 2013. I’d be happy to share all the details with anyone willing to listen, but for the sake of brevity, I’ll start by sharing a few tips that worked for me. After numerous failed attempts at low-carb, high-fat diets, this time around I tried a low-fat, high-fiber diet. The fiber ended up being a key way to keep my body and mind full between meals. It meant pre-loading meals with fruits and vegetables as my main course while treating main courses more like desserts—portioning just enough to enjoy. I kept things low-fat by sticking to small amounts of lean meats, low-fat dairy, and whole-grains—and avoided sugar as much as possible. I used WeightWatchers for tracking, which helped me learn how best to budget my daily intake. I find that I get hungry about every three hours, which means that four small meals throughout the day is enough to get me to bed without late-night snacks. For breakfast and an afternoon snack this usually consists of a bowl of oatmeal, berries, and banana. I use water instead of dairy and add whey protein. For lunch and dinner I eat small sandwiches using whole-grain breads. I find that it’s easy to keep bread and veggie burgers (low-fat protein) in the freezer as an easily available option. This has become a mental game for me. Plain and simple, healthy restaurant eating is not easy—but it is doable. I try to find the healthiest thing I can order and still be satisfied, and often head to the vegetarian options first. I also try to eat only half the meal and take the remaining half home. I avoid the salad section because I tire of salads quickly—the tasty ones have hidden fat, and it’s difficult to only eat half a salad. Besides, who looks forward to leftover salad? Not this guy. That said, a side salad before a meal can be a great way to pre-load some veggies (ask for dijon instead of dressing). I’m a family guy with two kids who does a lot of carpooling. This means I’m short on free time and need food options on the go. Subway and Chipotle are great because they’re everywhere and have healthy options if you cut out cheeses, creamy dressings, refined grains, and fatty meats. Plus, my kids always find something they like which means everyone is happy. It’s trendy to include a cheat meal or day in your diet, probably to prevent the boredom of long-term dieting. I don’t plan for cheat days because they usually just happen, often at get-togethers with friends or at work-related events. In these scenarios I’ll treat myself while trying to avoid over-indulgence. I mean, if you spent your valuable time making homemade cookies to bring to the party, you better believe I want to try one. 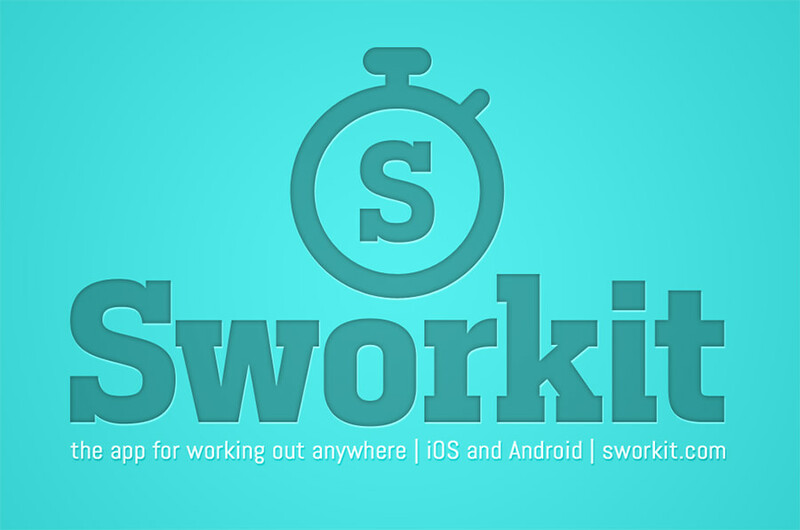 I highly recommend Sworkit for bodyweight exercises you can do anywhere. I’ve found that diet and exercise go together like peanut butter and jelly—you can’t have one without the other. Well, you can, but it’s just not the same. Here’s how I approached the exercise part of the equation. As I mentioned, I don’t have a lot of free time, which means I have to find ways to fit exercise into my daily regimen. I’ve found that if I put on my sweats when I get home from work or first thing in the morning, I’m more likely to exercise than if I shower right away. I look for segments throughout the day to fit exercise in, whether it’s five minutes or 50. If there’s one activity I would recommend for exercise, it’s running. I know it’s not for everyone, but it’s a great way to get a sweat going and just let your mind wander. I don’t run for distance. I figure out how much time I have available and turn around after I’ve been running for half of that time. When the weather isn’t nice enough for a run, I do bodyweight exercises at home. Think push-ups, pull-ups, sit-ups, and squats. These are great because you can do them anywhere—even at the office, and for the most part, you don’t need equipment. For full-body exercises, I recommend the 7-Minute Workout for beginners, and my new favorites, Sworkit (which has a built-in 7-Min option) and You Are Your Own Gym, as more advanced options. Also, Runtastic has a number of bodyweight training options. The last thing I recommend is to create some short-term and long-term goals for yourself. I set out to diet for the full year and to get through the holiday seasons that had been killers for me in the past. The first three months I wanted to lose 2 pounds a week; lately, it’s been more like half a pound. Also, find a way to reward yourself. The days I weigh-in under goal for the week, I enjoy a frosty pint of beer and then set the bar lower the next day. I’m not going to promise that what worked for me will work for you because we’re all wired differently. I do believe there’s a diet and exercise program for everyone, and that changes are possible. Find what works for you and stick with it. I CAN promise you will be happier for it. Also, check out related tips on Trevor’s You Matter.